Quality trout is easy to recognize. Fresh trout never smells fishy, it smells fresh. The eyes should appear bright and clear, almost alive. The gills should be reddish, and the skin covered with clear, slippery slime. Very fresh trout should be so slippery they are difficult to hold. 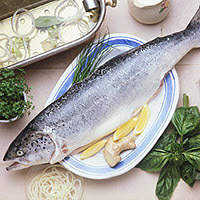 Fresh trout flesh will give slightly when you press it with a finger, then spring back into shape. Rainbow trout, native to the United States, are raised in concrete troughs wherever an abundant source of clean water is available. The flesh is mild, delicate, and sweet. Steelhead trout has pink flesh and a mild trout taste. Most rainbow and steelhead available on the market is farm-raised. Arctic char, another trout family fish, either dwells in lakes or lives in salt water, but spawns in fresh water. Whether wild-caught or farm raised, its flesh varies from pink to red, depending on the size. Wild-caught lake trout (also called togue or gray trout) has a higher oil content than other trout and its flesh may be white or pink. Trout is nearly always sold whole and gutted. Boneless trout is also available.